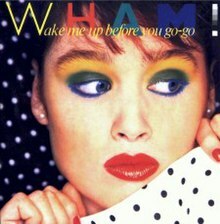 "Wake Me Up Before You Go-Go" is a song by the British duo Wham!, first released as a single in the UK on 14 May 1984. It became their first UK and US number one hit. It was written and produced by George Michael. The single was certified Platinum in the US, which at the time commemorated sales of over two million copies. In 2015, the song was voted by the British public as the nation's 13th favourite 1980s number one in a poll for ITV. It was also ranked number 28 on VH1's 100 Greatest Songs of the '80s. Michael's inspiration for the song was a scribbled note that his (Wham!) 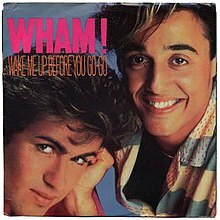 partner Andrew Ridgeley had left for his parents, intended to read "wake me up before you go" but with "up" accidentally written twice, so Ridgeley wrote "go" twice on purpose. I just wanted to make a really energetic pop record that had all the best elements of Fifties and Sixties records, combined with our attitude and our approach, which is obviously more uptempo and a lot younger than some of those records. It's one of those tracks that gets rid of a lot of your own personal influences; it reminds me of so many different records that I couldn't actually nail them down. I'd done a demo at home that just had a bass line and a vocal on it. Usually, I write the record in my head; I know what all the parts are going to be and I sing them to all our musicians. And it was great. ... We actually did it as a rehearsal. We used a Linn drum because the drummer was late, and it was such a good track that we kept it. The song entered the UK Singles Chart at number four – after much hype from the duo claiming they would go straight in at number one, which was a rare occurrence then – and climbed to the top spot seven days later, staying there for two weeks. The song also went to the top of the Billboard Hot 100 in the United States, holding the top spot for three weeks. The music video for the song was directed by Andy Morahan. It showcases the band performing for an audience of mostly teenagers at Brixton Academy in South London. The band was wearing Katharine Hamnett t-shirt designs that said "CHOOSE LIFE". The video was listed in NME's "50 Worst Music Videos". All tracks written by George Michael. Note: The US 7" single (Columbia 04552) has identical track listing. ^ "Record News". NME. London, England: IPC Media: 36. 5 May 1984. ^ Westbrook, Caroline (25 July 2015). "The Nation's Favourite 80s Number One: 12 more classic 80s chart-toppers which didn't make the cut". Metro. Retrieved 27 July 2015. ^ "VH1: 100 Greatest Songs of the 80's". Rock on the Net. Retrieved 6 February 2017. ^ Connelly, Christopher (25 October 1984). "Wham! A wake-up call to the U.S.". Rolling Stone (433): 48. ^ "Sleeve designed by Peter Saville: Sleeves 1982-1984". Petersaville.info. Retrieved 29 March 2014. ^ Garcia, Alex S. "mvdbase.com - Wham! - "Wake me up before you go-go [version 1: concept]"". Music Video DataBase. Retrieved 29 October 2015. ^ NME.COM. "50 Worst Music Videos Ever". NME.COM. ^ "Australia n°1 Hits – 80's". Worldcharts.co.uk. Archived from the original on 9 January 2017. Retrieved 14 June 2013. ^ "Austriancharts.at – Wham! – Wake Me Up Before You Go-Go" (in German). Ö3 Austria Top 40. Retrieved 1 August 2013. ^ "Ultratop.be – Wham! – Wake Me Up Before You Go-Go" (in Dutch). Ultratop 50. Retrieved 1 August 2013. ^ "CHART NUMBER 1455 – Saturday, November 17, 1984". CHUM. Archived from the original on 29 July 2007. Retrieved 25 April 2014. ^ "Top RPM Adult Contemporary: Issue 9612." RPM. Library and Archives Canada. Retrieved 1 August 2013. ^ "Top RPM Singles: Issue 9520." RPM. Library and Archives Canada. Retrieved 1 August 2013. ^ "Song title 977 – Wake Me Up Before You Go Go". 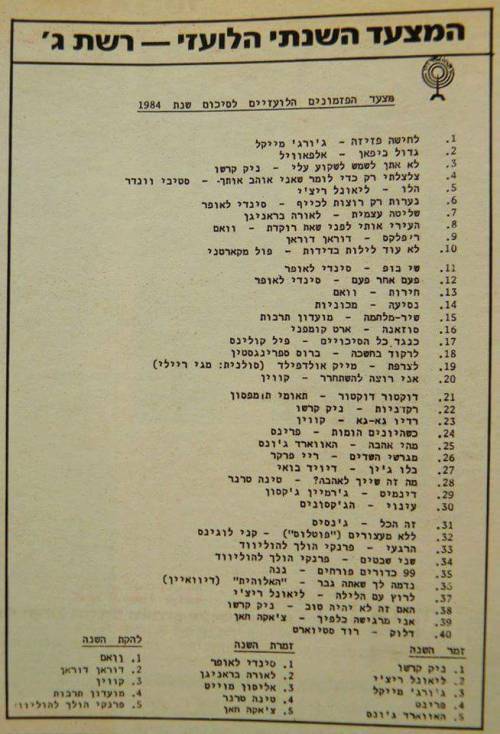 Tsort.info. Steve Hawtin et al. Retrieved 1 August 2013. ^ "Lescharts.com – Wham! – Wake Me Up Before You Go-Go" (in French). Les classement single. Retrieved 1 August 2013. ^ "Offiziellecharts.de – Wham! – Wake Me Up Before You Go-Go". GfK Entertainment Charts. Retrieved 1 August 2013. ^ "Archívum – Slágerlisták – MAHASZ" (in Hungarian). Single (track) Top 40 lista. Magyar Hanglemezkiadók Szövetsége. Retrieved 6 January 2017. ^ "Wham! Chart History". RÚV. Retrieved 7 November 2018. ^ "The Irish Charts – All there is to know". IRMA. Retrieved 1 August 2013. ^ "Indice per Interprete: W". HitParadeItalia (in Italian). Creative Commons. Retrieved 1 August 2013. ^ "Nederlandse Top 40 – week 29, 1984" (in Dutch). Dutch Top 40 Retrieved 31 December 2017. ^ "Dutchcharts.nl – Wham! – Wake Me Up Before You Go-Go" (in Dutch). Single Top 100. Retrieved 1 August 2013. ^ "Charts.nz – Wham! – Wake Me Up Before You Go-Go". Top 40 Singles. Retrieved 1 August 2013. ^ "Norwegiancharts.com – Wham! – Wake Me Up Before You Go-Go". VG-lista. Retrieved 1 August 2013. ^ "South African Rock Lists Website SA Charts 1969 – 1989 Acts (W)". Rock.co.za. John Samson. Retrieved 1 August 2013. ^ "Swedishcharts.com – Wham! – Wake Me Up Before You Go-Go". Singles Top 100. Retrieved 1 August 2013. ^ "Swisscharts.com – Wham! – Wake Me Up Before You Go-Go". Swiss Singles Chart. Retrieved 1 August 2013. ^ "Official Singles Chart Top 100". Official Charts Company. Retrieved 1 August 2013. ^ a b c "Make It Big – Awards". Allmusic. All Media Network. Retrieved 14 June 2013. ^ "CASH BOX Top 100 Singles – Week ending NOVEMBER 24, 1984". Cash Box magazine. Archived from the original on 1 October 2012. Retrieved 25 April 2014. ^ "Listy bestsellerów, wyróżnienia :: Związek Producentów Audio-Video". Polish Airplay Top 100. Retrieved 12 February 2019. ^ BigKev. "Forum – ARIA Charts: Special Occasion Charts – Top 100 End of Year AMR Charts – 1980s". Australian-charts.com. Hung Medien. Retrieved 25 April 2014. ^ "Jaaroverzichten 1984" (in Dutch). ULTRATOP & Hung Medien / hitparade.ch. Retrieved 25 April 2014. ^ "Top Singles – Volume 41, No. 17, January 05 1985". Collectionscanada.gc.ca. Library and Archives Canada. Retrieved 25 April 2014. ^ "Single Top 100 over 1984" (PDF) (in Dutch). Dutch Top 40. Retrieved 25 April 2014. ^ "Jaaroverzichten – Single 1984" (in Dutch). Hung Medien / hitparade.ch. Retrieved 25 April 2014. ^ "Top Selling Singles of 1984 | The Official New Zealand Music Chart". Nztop40.co.nz. 31 December 1984. Retrieved 22 January 2018. ^ "Schweizer Jahreshitparade 1984". Hitparade.ch (in German). Hung Medien. Retrieved 25 April 2014. ^ "The CASH BOX Year-End Charts: 1984". Cash Box magazine. Archived from the original on 30 September 2012. Retrieved 25 April 2014. ^ "Top 100 1985 - UK Music Charts". www.uk-charts.top-source.info. Retrieved 22 January 2018. ^ "Top 100 Hits for 1985". The Longbored Surfer. Retrieved 25 April 2014. ^ "ARIA Charts – Accreditations – 2017 Singles". Australian Recording Industry Association. Retrieved 10 February 2017. ^ "Canadian single certifications – Wham! – Wake Me Up Before You Go-Go". Music Canada. ^ "Danish single certifications – Wham! – Wake Me Up Before You Go". IFPI Denmark. Scroll through the page-list below until year 2017 to obtain certification. ^ "British single certifications – Wham! – Wake Me Up Before You Go-Go". British Phonographic Industry. Select singles in the Format field. Select Gold in the Certification field. Type Wake Me Up Before You Go-Go in the "Search BPI Awards" field and then press Enter. ^ "American single certifications – Wham! – Wake Me Up Before You Go". Recording Industry Association of America. If necessary, click Advanced, then click Format, then select Single, then click SEARCH.